Vizio, a company known mainly in the US for the affordable HDTVs they make, announced earlier today at CES 2011 they are going to release a whole “ecosystem” called Via Plus. 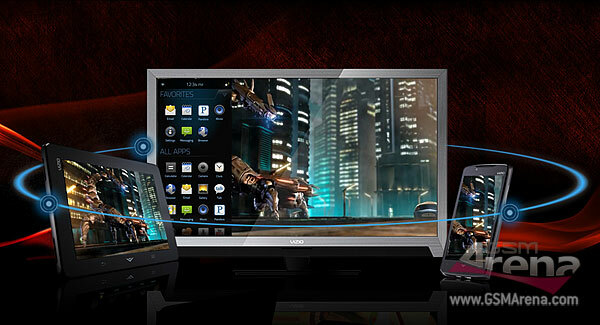 As part of it Vizio are going to release the Vizio Via Phone, the Vizio Via Tablet and special Vizio HDTVs. The idea behind the “Via Plus Ecosystem” is to allow seamless and unified control between the Vizio tablet, phone and TV. This is going to be accomplished by a user-friendly interface going on top of the Android that the Vizio Tablet and Vizio Phone will be running. The Vizio phone will have a massive 4” capacitive touchscreen, most probably with a WVGA resolution of 800×480. It also packs a 1Ghz processor, but whether it’s a Snapdragon or a Tegra 2 is unknown at this moment. Connectivity-wise the handset has 802.11n Wi-Fi and Bluetooth as well as a GPS receiver. Two cameras are present – one at the front for video chatting and one 5MP snapper located at the back, capable of recording HD video. The main feature though is the built-in IR blaster, enabling the phone to function as a universal remote control to reportedly 90% of all available home appliances. Other standard features are 2GB of internal storage, expandable via MicroSD card slot and an HDMI port for HD video playback. The 8” capacitive touchscreen Vizio tablet is going to run so-far-unknown version of Android with the same customized interface as the Vizio phone. The similarities don’t end here. 802.11n Wi-Fi, Bluetooh, GPS, front-facing camera, HDMI output for video playback, 2GB of internal storage with MicroSD card slot for expansion and the same 1Ghz processor are to be found on the tablet as well. Following the example of the Vizio Phone, the tablet will also come with an infrared blaster. Oh, the tablet will also feature 3 speakers – two along the top and one at the side for a solid surround sound experience. And to wrap up, Vizio will also launch a number of HDTVs later this year. Among them will be a 65” 2D/3D HDTV that would offer “The ultimate 3D experience”. Two more LED LCD 21:9 aspect ratio displays with 2560×1080 Cinema HD resolutions are also going hit the market in 50” and 58” sizes.